Here at Von Anthony Salon, we have created a beautiful canvas to help you achieve your dream hairstyle. We are dedicated to our craft and committed to meeting the needs of our guests. Our mobile app promises to deliver this same level of service and commitment to excellence from your very own mobile device! It’s free, easy to use, and will help simplify your busy life. The app allows you to schedule appointments at your convenience and receive confirmation from one of our staff. Once your appointment is set, it will even remind you so you’ll never miss your salon time! 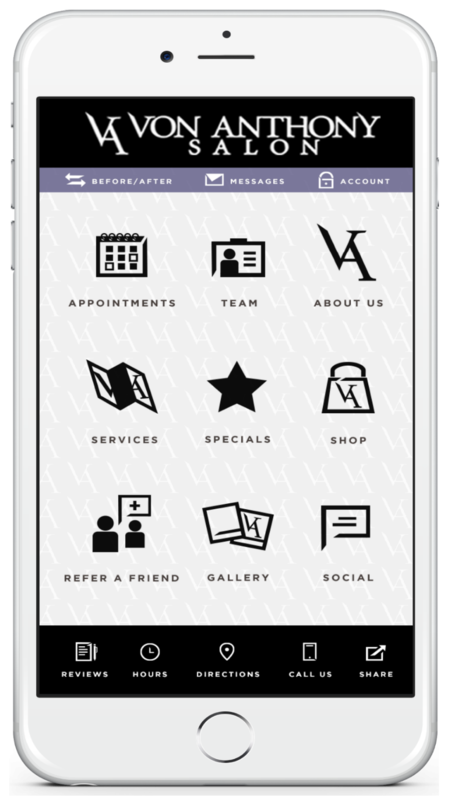 The Von Anthony Salon mobile app is a great tool to help you manage your salon needs and services. Are you ready to try it out? Find it today on iTunes, Google Play, or Amazon, and if you have any questions, call us at 972-731-7600.